There are three entrances to the City walls: the entrance by Inner Pile Gate (main entrance), the entrance by St Lucas Fortress (St Dominic's street) and the entrance by St John's Fortress. If you do not wish to tour the entire length of the city walls, you can end the tour at any of these entrance points. The walk on the walls usually lasts from ninety minutes to two hours. Take into consideration that you will have to climb the stairs of some parts of the City walls, so put on some comfortable shoes. Make sure to bring a bottle of water with you for refreshment and to protect your head, as during the tour you will be exposed to plenty of sun. For a more pleasant experience, an early morning (as early as possible) or late afternoon (starting from approximately 5 p.m.) walk is recommended. Ticket for the City walls tour is valid for sightseeing at Fortress Lovrijenac. Do not miss the opportunity to visit Lovrijenac Fortress which offers a magnificent view of the Pile Gate and Old Town. You can get to the fortress by climbing the stairs located by the bus stop at Pile Gate entrance. Please be sure to exercise caution during the tour. Don't do anything that would endanger yourself or others. How to reach city walls entrances? Some cruise ships on their visit to Dubrovnik anchor next to the island of Lokrum and in front of the Old Town. Passengers are transferred to the old city harbour by tenders. The nearest entrance to city walls is located very close to this point. After leaving port turn right and walk along the St Dominic's street until you reach St Lucas Fortress. You will see the gates and selling point. After disembarking the ship take any city to the Old Town (no. 1A, no. 1B, no. 3) and ride it until the last stop. Walk through the Pile Gate. Once you step onto Stradun through the Pile Gate, there is an office on the right-hand side where you can purchase tickets for the City Walls tour. Tickets can be paid by credit cards or Croatian kunas - no Euros accepted. The main entrance to the walls is located on the left-hand side. 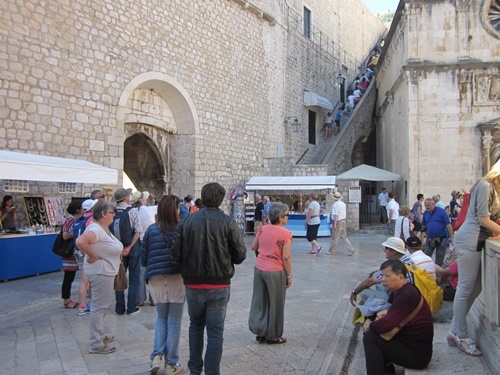 You can save when buying Dubrovnik Card which include free visit to City walls. The adult entrance fee costs 200 HRK (visit to the Lovrijenac Fortress is included in the price), children (5-18) costs 50 HRK and children under 5 years don't pay fee for the entrance. Take either city bus no. 4 or bus no. 6 and ride it until the last stop (Pile Gate). Get off the bus and walk until you reach Stradun. Check the instructions above.